Beauty is addictive I've decided. I came to that conclusion this morning while browsing through the hiking / travel guide books I brought with me, looking for the next great adventure. As if yesterdays visit to The Wave should have been enough beauty for a lifetime. But I've jumped too far ahead. Let me recap yesterday. I decided to take the park rangers advise and drive south through Fredonia, across the Kaibab Plateau and approach the wire pass trailhead from the south. It's the long way around, but a higher probability of success, especially after more rain last night. This lower section of House Rock Valley road is primarily gravel while the upper half is clay. The rangers advice I didn't follow was getting an early start. Linda's alarm clock goes off at 6:45 am and that is early enough for me. While she showers, I pack sandwiches, chips, Rice Krispy treats and Laura bars. I plan on taking 10 bottles of water (also recommended by the Ranger). Linda and I leave the trailer at the same time. The drive is pleasant in the morning sun and traffic is light. I fill up with gas at Jacobs Lake which also serves as the entrance to the North Rim of the Grand Canyon. I'm soon speeding along the gravel road at 45 mph. Which feels fast on a dirt road even in my jeep. I slow down for the rough spots, but not so much for the occasional pools of water. I feel an odd sense of pride as I pull into the Wire Pass trailhead with the dirtiest vehicle in the parking lot. I pack my backpack making sure the permit is on the dashboard of the FJ and the detachable permit is wired to my pack. I take a picture for safety reasons incase the permit is lost. The Rangers do a pretty good job at highlighting the large fines for hiking without a permit. To me it seemed silly that they would tell this to the lottery winners who will be issued a permit and not tell this to the larger group - the majority of whom will not be receiving a permit. Maps, water, camera and GPs. Check. I start down the trail and drop into the wash. I follow the many footprints down the rocky and muddy trail and around the bend. I've hiked this trail before, but after what seemed like a long time, I start to question if I've missed the trail out of the wash. Relieved to have remembered the Ranger provided map and guide I did in my pack and fish it out. The trail breaks at about .5 miles, I'm at .4 miles. Sure has felt longer, but I chalk it up to being excited and begin again. No one could miss this exit! This truly is a freeway trail and the many prints all cut up the hillside and onto the sandy bench. I scan the upcoming ridge and spot what I remember to be the ascent point up a small dryfall. The ridgeline itself is impressive and I take my first break at the top of the dryfall. While resting I admire the view east. Scanning the horizon I spot a familiar sight. Most would not recognize the drab knoll of unnamed peak 5365, but I had hiked around it on my way to Cobra Arch a couple years ago. I remembered looking west as I hiked along that distant horizon admiring the ridgeline I now occupy. With the stunning Steamboat Rock and Buckskin Gulch between us. Following the guide map I skirt high on the slickrock as I head south. I notice the signage in the bottom of the slickrock bowl, but why hike down only to hike back up the next level? Rounding to the west of the Twin Buttes I see the first group of people. A group of 4 hikers moving slow and enjoying every nook, cranny and Hoodoo. 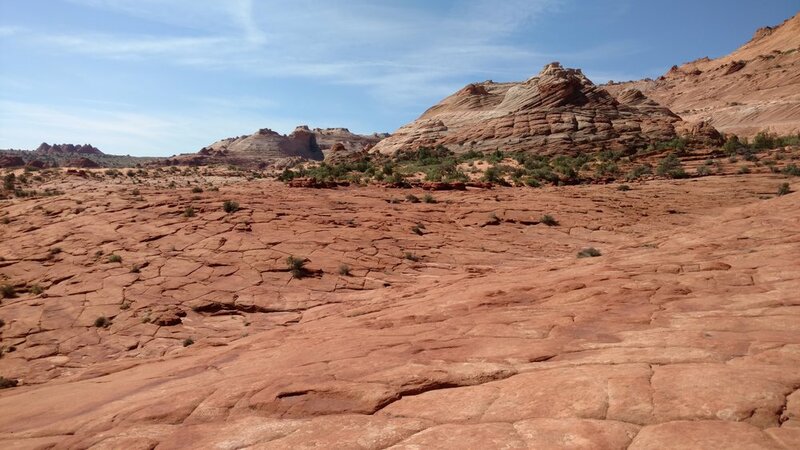 Dropping into a slickrock wash, I meet the first group already returning from The Wave. I glance at the time and it's barely 11:00 am. They must have gotten here very early and / or they are afraid of the heat. The temperature is only supposed to reach 85 degrees today and for August in this Southern Utah desert it is cool by any standard. Pools of water dot the landscape from the recent rain so even with simply a lifestraw (which I always carry) one could stay a long time even if the canteen goes dry. 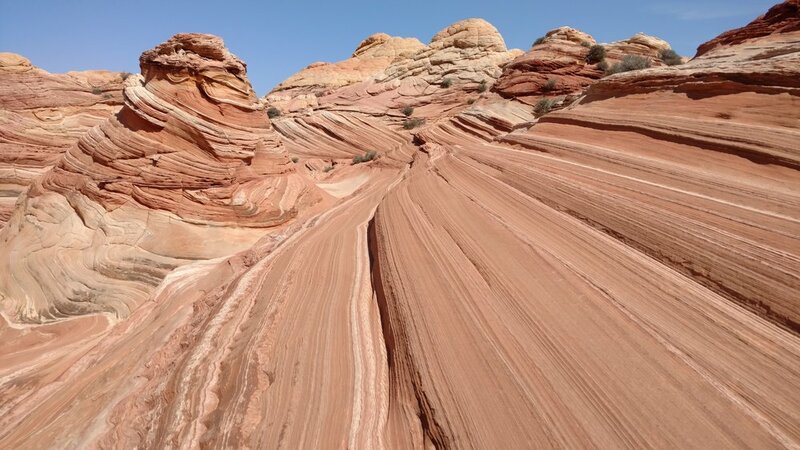 The Wave isn't a long hike, nor is it a particular difficult hike and I sit on a ledge just before dropping into the wash before the final ascent up and into The Wave. 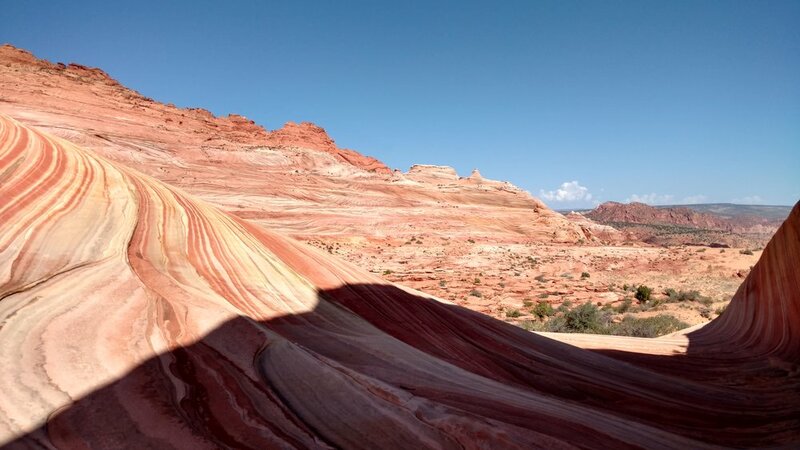 Behind me resides the impressive Coyote Buttes with its impressive array of Hoodoos and pinnacles of colored rock. These spires are breathtaking and the next time I apply for a permit to this area it will be to climb this stunning peak. Dropping down and hiking up the sandy trail, I meet another group of 4 leaving. Soon I pass the group of two that was standing across the hall when we won the lottery. They too are leaving. I'm somewhat in shock, but the selfish side of me is doing a fist pump. 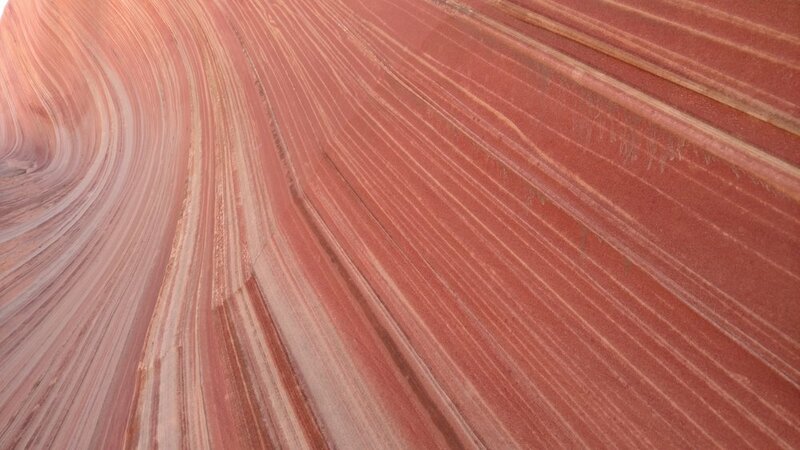 I drop into the shade on the cool sandstone wave and soak in the rare beauty of this place. A few people are still moving around, but the pocket is full of water which limits the amount of movement back and forth between sections. I decide this is a perfect time and space for lunch. The group of 4 approach with oh and awe's and sit around me for luch as well. I normally enjoy solitude, but the group is so spell bound by the beauty it is hard not to feel an instant kinship with them. It turns out 3 are from Los Angels and the 4th is a guide from Kanab. He smiles when I tell him I'm from Cedar City. "Don't get many locals anymore" he says as we share some common stories about the area. When asked what my plans are for the day, I told him I was hopping to summit Top Rock in addition to seeing The Wave. "It's beautiful up there" he says with a knowing smile. I picked up my pack and thanked them for the company during lunch. I spend the next hour just wandering around the area. The area know as "The Wave" is relatively small and I soon begin to work my way up towards the ridgeline leading up Top Rock. The ridge line is class 3 and perhaps 3+. There is exposure and one needs to be able to see the next 3 or 4 moves before taking the next step. A review behind is also very important, just a few feet either direction and the route becomes class 4 or 5 real fast. I'm trying to juggle the ascent, remembering the route and stopping every few feet to marvel at the view below me. The ascent is a classic slick rock scramble and I am loving every minute of it. I summit the Hoodoo nearest the geological coordinates for the summit of Top Rock. It would be fun to climb the other Hoodoos that are scattered around on the summit and I question if the Hoodoo further south is higher than the one I'm standing on. I decide not to worry about it and climb back down to the more level slickrock. The view in every direction is breathtaking, but none more so than looking down. I work my way over to the large Hoodoo near the edge and take more pictures. I question weather anyone will appreciate this Birdseye view, the beauty of The Wave is the smaller details, the tiny lines of yellow and red woven together in colorful detail. That detail is lost at this distance and they blend into the surrounding area. I take more pictures anyway. I continue to work my way around the alcove. I'm hoping to stand at or on the arch that is in this area. I can't see the arch, but I make my way as far as comfortable and stand next to a small hoodoo for more pictures. Working my way back down the slickrock takes time, but memory serves me well and I'm able to follow the class 3 route without problem. I wander around the pools wishing I had brought a swimming suit, when it dawns on me, I haven't seen anyone since my return to the main Wave area. I continue to explore some more before entering back into the main wave area. I'm alone! I take a few more pictures but eventually put the camera away and simply enjoy the experience. I take off my shoes and wade out into the water. Cool and refreshing I lean against the rock and eat a sandwich. I'd lie if I didn't toy with the thought of skinny dipping in this pool, but voices spook me before I remove anything other than my shoes and socks. Feet cool, socks dried, I put back on my shoes and head down the slope. I finally pinpoint the voices and realize they are coming from clear across the canyon. The group of 4 have taken refuse in a shaded alcove which is projecting their voices clear back across the wash. I bump into the group a couple more times hiking back along the trail, but I linger in the shaded areas to drink more water, reluctant to leave, and wanting to completely fill up my cup of experience. The sponge of my soul is full as I hike up the sand dune and down the rocky creek bed. Only 2 vehicles remain in the parking lot and the first is absent a wave permit. Last out is my favorite place to be.